I made this card with the Dasher single stamp. I embossed Dasher using VersaMark ink and Gold Embossing powder then added highlights to his antlers with 2-way glue and Red glitter from the Fine Galaxy Glitter Pack. I die cut the main circle (for Dasher) using the 3" Circle Big Shot Die and Very Vanilla cardstock. I used the Scallop Circles #2 Big Shot Die for the Red Glimmer paper layer. 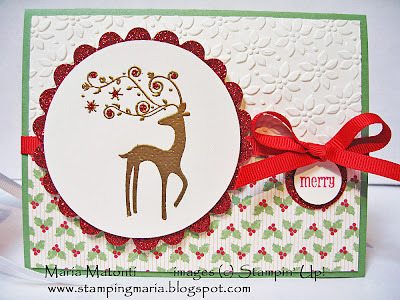 I stamped "merry" in Real Red classic ink and punched it out with the 3/4" punch and layered it onto a 1" Red Glimmer Paper circle. The "merry" image is from the Pennant Parade stamp set. I ran a piece of 4" x 5 1/4" Very Vanilla cardstock through the Big Shot Petals-a-Plenty Embossing Folder and cut a strip of Holly Berry Bouquet DSP to 2"x 5 1/4" and adhered the 2 pieces together. Then I adhered this background piece to the card base (Wild Wasabi cardstock cut at 5 1/2" x 8 1/2" folded in half) and tied Real Red 1/4" grosgrain ribbon around the card. The Dasher image is layered onto the Red Glimmer Scallop Circle with Dimensionals then that is layed onto the card over the ribbon with Dimensionals. Have a great weekend and don't forget about the CLEARANCE RACK BLITZ here!